For Assistant Professor - B.E./B.Tech and M.E./ M. Tech in relevant branch and must have cleared National Eligibility Test (NET) conducted by UGC. For Laboratory Assistant - Diploma /Graduate in discipline. Application Fee - Candidates have to pay Rs. 1000/- (for Assistant Professor) & Rs. 500/- (for Laboratory Technician) through DD in favour of Finance Officer Lucknow University, Lucknow. How to Apply - Interested candidates may apply in prescribed application form along with self-attested copy of relevant documents, experience certificate, recent passport size photograph & DD send to The Registrar, University of Lucknow- 226007 (UP) on or before 10.07.2017. 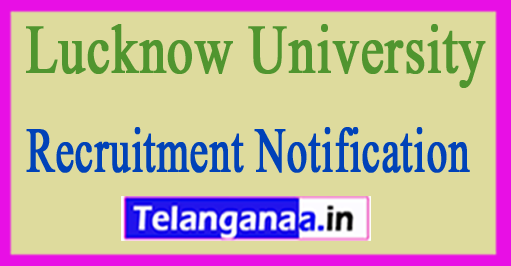 University of Lucknow invites applications for the post of Junior Research Fellow. Apply Before 16 January 2017. Educational Qualification - M.sc. in zoology/ Life Science/ Bio Science/ Biotechnology. Venue Of Interview - The Office of Head/ Committee of Department of zoology, Lucknow University, Lucknow.